Unfortunately, it’s not up on their website yet… as soon as it is, I will share the link. I’m too antsy to wait though… so here is my FIRST PUBLISHED FOOD WRITING (without any editing they did). I’m not excited or anything…. The term Alfresco is Italian and means “to dine outside, in the fresh open air.” Alfresco dining represents a fun, lively, experience – filled with aromas, flavors and sights that conjure up feelings of joy. After what felt like an extraordinary winter, followed by the first proper spring this city has seen in a long time, we urbanites can finally move into the warmer months with a new found renewal of life and an ever present desire to be outside. 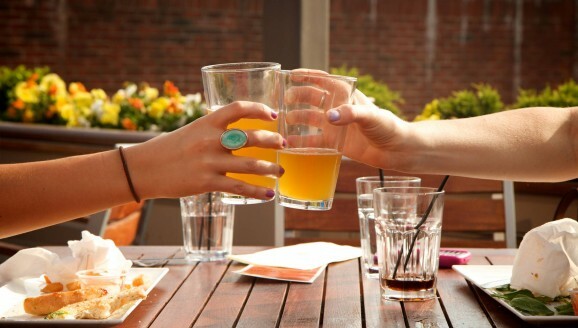 What better way to celebrate the season than to throw on those Ray Bans, grab your BFF’s and hit one of Boston’s premier patios for an alfresco brunch? Not only will you have access to some of the best people watching this town has to offer, but combine that with an incredible meal on a sun-kissed patio – and you’ve got a recipe for perfection. We’ve even taken the leg work out of it for you by choosing six of our city’s finest brunch venues. So sit back, get ready to whet your appetite and book that brunch date at one of these fabulous hot spots! Located in one of the hippest parts of town, The Beehive is a bohemian enclave in the South End featuring a simple yet eccentric dining experience that leaves you wanting more. Offering brunch on their easily accessible patio every Saturday and Sunday from 10-3, the menu is filled with what the General Manager likes to call “food with soul”. With focus on local, sustainable and in-season ingredients, the menu reads likes an old world European novel, showing influences from the Middle East, America, Eastern Europe, and Africa. 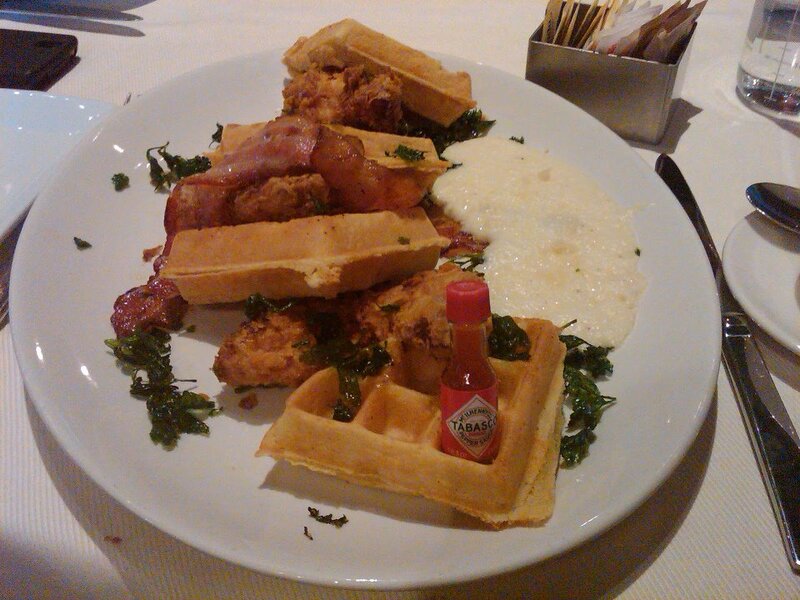 The chef’s goal is to bring “soul to the table” and we think they certainly do. Menu favorites include the Eggs Shakshuka – poached eggs, North African-style tomato sauce, polenta and (for a small extra charge) Moroccan sausage ($14.5) and the brunch classic, Eggs Benedict ($14). The menu is quite intriguing and includes brunch appetizers, like the Golden Red Beet Soup – with thyme, dill and yogurt crème fraîche ($10) and a raw seafood bar with platters that will accommodate up to six guests. The restaurant uses four local fishermen to supply their seafood, so specials and offerings change daily based on the fresh catch. Each week also offers a variety of brunch specials based on what’s in season and what the local farmers are offering. The patio itself is in a prime location for some of the most eclectic people watching the city has to offer. Surrounded by arts, music and hipsters abound, The Beehive is a prime alfresco dining location. 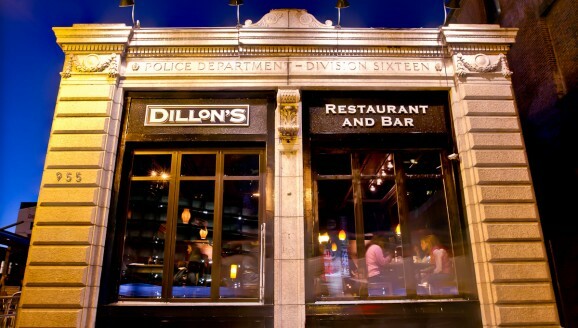 Built in 1887 and once a landmark Police Station, Dillon’s Restaurant and Bar is a local favorite that offers two floors of dining with a Prohibition Era feel, as well as the “best patio in the Back Bay” according to their website. Located adjacent to the indoor space, Dillon’s trendy sunken patio offers spectacular views of the prudential building and a first-hand look at the fashionable Boylston Street style setters. The American-fusion brunch menu offers traditional fare such as Dillon’s Breakfast – 3 eggs any style, bacon, sausage, or ham, a toasted English muffin and skillet potatoes (a great deal at $8) to more interesting options sure to please even the most refined gourmand. We’re big fans of the Lobster Omelet – 3 egg omelet with lobster meat, goat cheese and green onions, served with skillet potatoes and toast ($13) and the Stuffed French Toast – French toast stuffed with cream cheese, bananas, blueberries, cinnamon, encrusted with pecans and served with maple syrup ($9). While most of their brunch options will leave you feeling comfortably full, we love that they also offer a few options for the diet-conscious, such as the Fruit Parfait – strawberries, blueberries, raspberries, granola mix and yogurt, layered an chilled ($6) and the Field Frittata – egg, spinach, mushrooms, scallions, American cheese, and tomato in a skillet, served with an English muffin and skillet potatoes ($10). 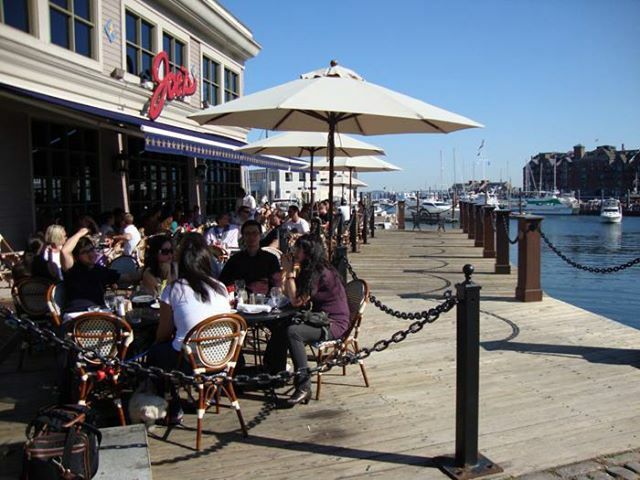 Located just steps away from the hottest tourist attractions down town, Joe’s waterfront location offers picturesque views and a beautiful backdrop of everything notable Boston has to offer. With an incredible outdoor patio that seats up to 200, guests can choose a waterside harbor view, to overlook the activity in the historic Christopher Columbus Park or to sit in the beautiful garden area. No matter your mood or desires, this patio is where it’s at. 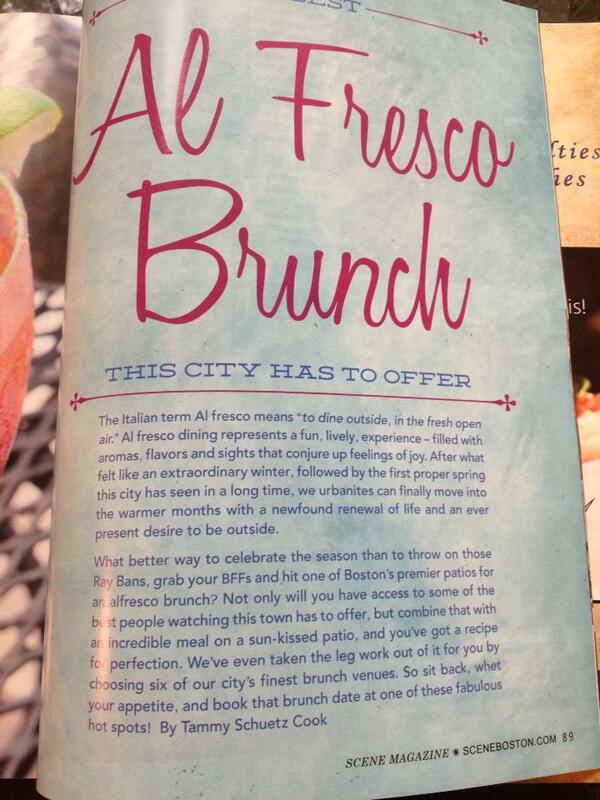 With brunch being served every Saturday and Sunday, alfresco dining at Joe’s is a definite “must do” for any Bostonian. 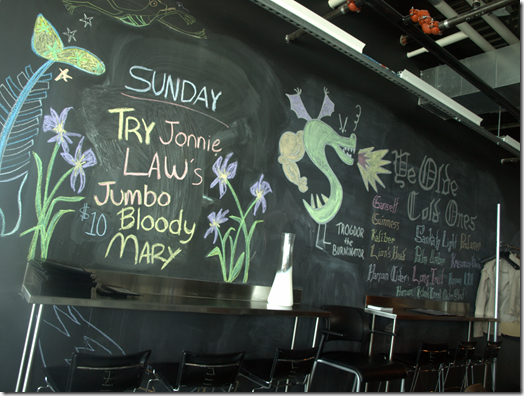 Joe’s menu is classic American cuisine with a strong focus on fresh and seasonal ingredients. With a completely “from scratch” kitchen and many locally sourced ingredients, the chef’s flexibility and creativity continue to please even the most refined of tastes. Weekly brunch specials are a big hit, but menu favorites include the Eggs Benedict – two fresh eggs poached on an English muffin with Canadian bacon and house-made hollandaise sauce ($12.99) and the Omelette Your Way ($9.99). We love that entrees are served with a peasant loaf and orange marmalade, because what better way to soak up all the goodness the brunch cocktail menu has to offer? The Spicy Bloody Mary (a staff and customer favorite), is created using a house-made mix and just the right kick and the Back Bay Sangria, which includes fresh peaches and seasonal fruit, is always popular. Oh, and did we mention you might even bump into one of the Bruin’s players? The brainchild of Esti Parsons (of Rialto and Radius fame), Sam’s is located on the second floor of the new Louis Boston, just minutes from downtown Boston on Fan Pier. 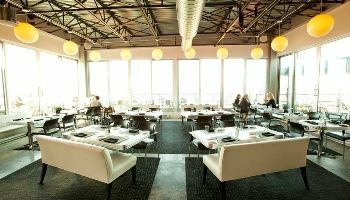 Boasting the most amazing 360 degree panoramic view of Boston Harbor, with elevated seating that will leave even the most connected Bostonians drooling, alfresco dining at Sam’s is an experience in itself. Be prepared to see and be seen at this brunch, which is served every Sunday from 11-3 – with a modern American focus on organic and sustainable food using local and extraordinary ingredients. We hear that brunch is staff favorite to work, with classic 90’s rocking in the background and an incredibly fun and chill vibe all around. We love the avant-garde feel of the menu, which changes every six to eight weeks, based on the freshest ingredients available. Customer and staff favorites include the Homemade English Muffin – currently being served with crab salad, Tasso ham, fresh hollandaise and a fried egg (this changes seasonally) and the House-smoked Trout – served with faro, mache, pickled onions and a horseradish crème fraîche. Other interesting options include the Mushroom Tofu Burger for those who prefer vegetarian and the Cranberry-pecan Croissant Bread Pudding for a special indulgence. The favorite brunch cocktail is the Bloody Mary of course, but this one comes with a hefty portion of Jonnie Law jumbo lump crabmeat. 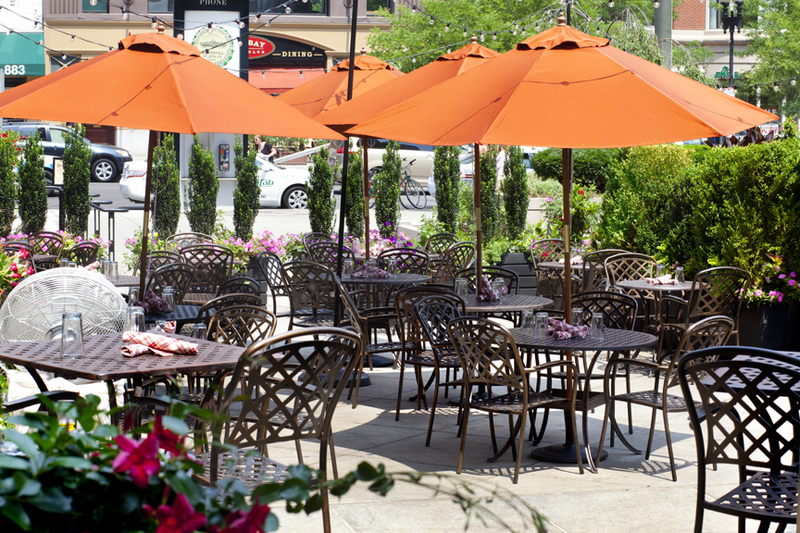 Sam’s clearly has one of the most amazing patios this city has to offer and did we mention it has its own parking lot? Score! Stephanie’s on Newbury has been a Boston staple since 1994. 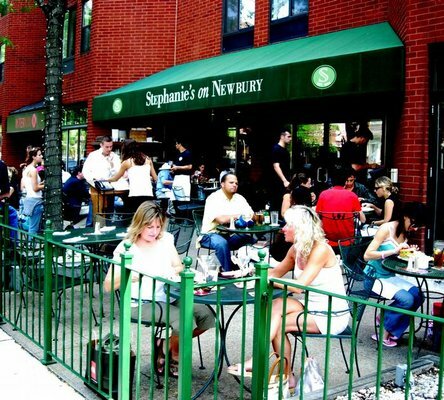 One of the most famous and certainly the largest patio along Boston’s legendary Newbury Street, Stephanie’s has a fantastic reputation when it comes to elegant outdoor dining. Known as a prime location for people watching, Stephanie’s patio is consistently chock-full-of eager diners awaiting their meals. 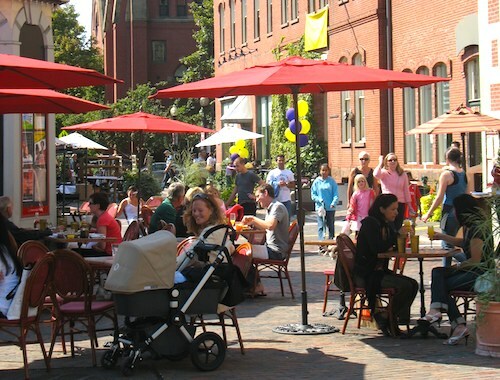 Located on the corner of Newbury and Exeter Street, this “sidewalk café” sits on one of the busiest stretches of shopping and outdoor dining in the Back Bay. Stephanie’s offers diners a varied and extensive brunch menu every Sunday from 11-3. The menu features “comfort food with a twist”, with influences taken from American, Latin American and Californian roots. The large patio, which seats about 100 diners, rests along the shady side of Newbury Street, offering the ultimate outdoor dining experience. Popular dishes include the Crab Cakes Benedict – sautéed crab cakes with poached eggs topped with jalapeno hollandaise ($18), the Lobster Roll – fresh lobster meat tossed in mayo, lemon, mustard and served on a roll (market price) and the Frittered French Toast – cheese and raspberry jam stuffed between battered French toast ($15). What’s brunch without a cocktail? How about the ever-popular “build your own” Blood Mary ($11.50) – where you choose your vodka, spirits, mix, garnish and rim for a truly unique and delicious experience. Or the Executive Mimosa ($13) – crafted by a staff member and guaranteed to cure that late-night hangover. Whatever your poison, we feel certain you won’t be disappointed! 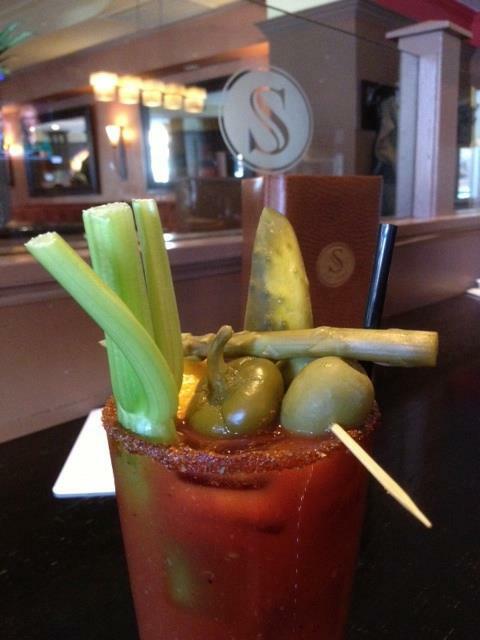 One of many Bloody Mary options at Stephanie’s…. Towne Stove & Spirits is the collaborative effort of Boston culinary icons, Chefs Lydia Shire, Jasper White and Mario Capone and has quickly become an upscale “it” spot for business. The menu is changes seasonally, focuses on locally-sourced ingredients and can be classified as American Eclectic. Brunch is served every Saturday and Sunday from 11-3 on the outdoor patio. Private, quaint and down-right romantic, the outdoor dining space at Towne is a hidden oasis amongst the hubbub of Boylston Street. Surrounded by high bushes with Tivoli lighting strung overhead, Towne’s patio offers a brunch menu which doesn’t disappoint. There is even a semi-private “bird cage” located in the patio, which seats 15-20 folks for an even more special experience. Popular dishes include the Lobster & Avocado Eggs Benedict ($16), Chicken and Waffles (a staff favorite) – served with grits, bacon & Tabasco ($16), Roast Beef Skillet Hash – crisped with organic eggs of your choice, poached or over easy ($16) and the Kitchen Sink BLT – served with the house special Xtreme French Fries ($10) – a cross between French fries and home fries; crisp on the outside and soft on the inside. On an interesting side note, Towne was nominated as one of Boston’s best singles bars by CBS Boston… so grab your wingman or woman, order one of Towne’s famous 22oz Bloody Mary’s and get your alfresco brunch on!